and drive on the east edge of his property to our old favorite spot. He has marked the south side of his property for us to better tell his property line. The trail has a good start from windriders traveling there today, You should find your way easily. but the wind blew the water over the road, one car got stuck on the middle road driving out. The rest of us drove up in the weeds, when we left. The land owner doesn't want us to do that. Park by the corrals for now, plenty of water. We need to wait for the water to go down, before we can use the middle road again. The land owner had his fence cut, and is not as likely to let us use his property for access now. The corrals seems to be a fine option, for now. Access is as usual, just take middle road by the Lake,to old rigging spot. Take rakes to start clearing rigg area. We went to Rush Lake Saturday. There are many new houses to the West of the lake. When we went last week, we noticed some dirt piles on the road, we didnÃ¢â‚¬â„¢t think much of if, but kind of thought a land owner was trying to block our access to the water. When we went back Saturday, there was a couple of strands of barbed wire across the upper road, the one that runs parallel to the wooden fence post, fence. We talked to the owner "Rush Mike" and found that he owns a section of the upper dirt road we have been using, he just blocked it Ã¢â‚¬Å“to get us used to using the lower roadÃ¢â‚¬Â, because he is going to fence in a pasture and have livestock in it. He is not concerned about us using the land past his property, we just have to use the lower road. My concern to him was that the water may rise to make the lower road UN usable. He may work with us and put a usable fence in if the water gets to high to use the lower road. I have his phone number and will be the voice of the UWA to this land owner, if the group wants me to. I have contacted "Rush Randy", that is the owner of the property on the East side of Rush Lake, He was very helpful in helping us remove a fence in the middle of the lake a few years ago. He is willing to work with us on access on the East side of Rush Lake, if we decide that is the direction we want to pursue. We discussed an arrangement similar to Rocky point on Utah Lake years ago. Leasing access with a gated key, and UWA members buying a key, on a yearly basis. We would have permission to cross the RR tracks over by the corrals east of the cottonwood trees. There is an old dirt road that travels north and Randy would excavate an access to any spot we desire. Pretty cool guy. I have been communication with Randy for years about Rush access, and will be the voice of the UWA if the group wants me to. We should have a discussion here, on the forum, then move forward as the group desires. We also heard that the chemical burn plant south of Rush, is using a HUGE amount of ground water a DAY, they started in what, 2002, the lake has been going dry since, what 2003. Maybe now that they are close to wrapping up distroying all the weapons, maybe the lake will stay higher??? Last edited by Marty Lowe on Wed Jun 29, 2011 6:18 pm, edited 5 times in total. My vote goes for Marty as the voice between UWA and those involved with access to Rush (hopefully Lake). Brian found a BLM map. it goes into the lake. I also vote for Marty to be our spokesman. He has talked with these people before, and as a former rancher and private land owner, who has had issues with trespassers and fence problems, can relate to them and speak their language. From the looks of the BLM map, our prime kiting launch site sits on private land. Keeping the land owners happy, could help retain access to this spot. Better in this case, to get permission first, as there may be NO forgiveness later. Remember what happened with the PC Tailister property. Let's don't let a few ruin it for all of us. Just some of my thoughts on the issue. I'm a little concerned about the future of Rush in that way. Setting a precedent of payment access is a little dangerous. Rocky Point went away because the land was taken over by heirs or another company and we lost it. Rush Mike might be really cool, but when he's not calling the shots anymore for whatever reason a huge risk is presented. Although drought is the biggest risk adversary. Not even mentioning the big L word. 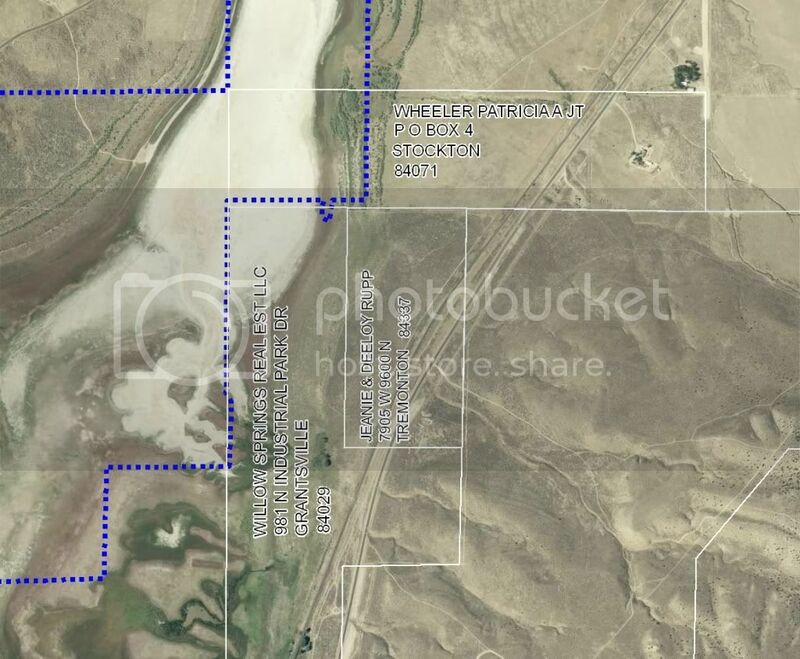 We should very carefully find out who currently owns the lake area (50% BLM, 50% Private I believe see first link below, also see the 2008 post on Rush Lake Fence that Marty referenced above ) and find out once and for all what our given access rights to the water's edge are. Too bad that the private property is right at the launch. One thing is for sure. We must be strategic and diplomatic about it. Stating the obvious: PLEASE DON'T ARGUE WITH ANYBODY OUT THERE WHILE WE WORK THIS ALL OUT. We don't want to burn the bridge Marty is building. http://scienceviews.com/indian/rushlake.html early Windsurfer's strife. ... Interesting story. Marty, thanks for your efforts, I think you are the perfect voice for the Rush Project. Thanks for making it better for a whole bunch of us wind lovers. I would love to sail out there again....hopefully it will be soon. The photos below do not show the new developments at Rush. The old rigging area is directly west, across the lake (dry) from Patricia Wheeler property. Rush Mike, owns part of the property in the upper left of this photo. The water is already covering the road closest to the lake. The road going directly west un usable, there are houses there also. I am going to venture a guess that it will get high enough, even if it is only for a few weeks. I think he said he said He has owned this property for over 10 years, and has no issue with our use. We will just hammer out some details when we need to. Rush Randy is Willow Springs real estate, in the above photo. His property has access on the east side, over railroad tracks, to the water. He is willing to help us out in any way, but won't open his property to just any one, hence the key idea. They had no issue with us using the area, but I will contact him again and get new info. he said there is a way to get the BLM to protect BLM access roads from closure if we can get it designated for recreational use. All this would be worth perusing, if Rush was a guaranteed spot for us. But for now just use the lower access road on the west side, and we go from there. Just another little tid bit. That little tid bit is major. We have to establish that for sure. The old BLM article about the lake from above stating Rush Lake's recreational uses may end up being pretty useful here. At least they may consider keeping an access road grated around the private properties. This is more reason for us all to dig out old Rush Photos showing our years of recreational usage of the lake. Go Get Em Marty! Let us know if there is anything we can do to help. i'm behind the key idea- beneficial to both parties involved. we get access and the landowner gets some side money. as long as we don't trash the land we should be golden for a short time. rick- i'm confused and would like to understand the danger of a pay for access agreement. it just seems to me that if we go in with a heavy stick lobbying for BLM access, we could really piss off the landowners and make our possibly jeopardize our possibly short time with a full rush. if down the line land ownership transfered to a non agreeable party, i don't see why the pay for access precedent would be bad. we could just us the BLM access argument from there on, right? either way- Marty- you are the man. use your silver tongue to keep rush access going! Thanks! I can totally understand your concern about my comments and I appreciate the question... However, I'm not talking about strong lobbying... I'm talking about seeing what our simple access rights are to Rush per the BLM so that we aren't cutting out rights to access that we should already have. I wrote "carefully find out"... I think Marty knows what I'm talking about. Perhaps the BLM already has a plan for the lake that allows unrestricted easement to the significant part of the lake. Best access for recreational use. (Preferably our old reach). Possibly even east side access as he mentioned. If I'm a landowner and I find out that an easement/access right already exists, then I don't even get riled up knowing that the right is established previously. Not even an issue for me. I'd just be like: "Oh, my bad."... No big deal. But the easement may very well NOT be there. White lines are parcel boundaries. Yellow shading is BLM land. Looks like this land has been subdivided a bit since my last map. There are 4 lots and a new road planned that will bisect our preferred access road. I don't have owner names for all the parcels but I will look into it a bit more when I get a chance. Maybe UWA should buy the beach front lot. brian.doubek wrote: Maybe UWA should buy the beach front lot. Hilarious! If it's going for about 40 cents an acre. Perhaps we can get a couple of us windsurfers to homestead some property. Nice map Brian! Yeah, that triangle that dips into the "water" is pretty much our launch right? Strange division of the lake there. Marty, is that triangle Rush Mike's? RickHeninger wrote: Marty, is that triangle Rush Mike's? he talked like, he thought it was NOT private. That may be news to him. The private property option from Rush Randy is looking like a thing that may have to happen some day. His property is touching the triangle, to the SE. every little piece is very helpful. Thanks Brian, I kinda knew you may re do your previous work. Hmm? I wonder who owns that triangle. That's a pretty crucial piece for us. I totally agree, we need keep the dialogue going. The body of the UWA consists of a lot of minds and talents... Please contribute if you have anything that can help Marty on this.